Winners of the Archiprix International / Hunter Douglas Awards 2017 are…. 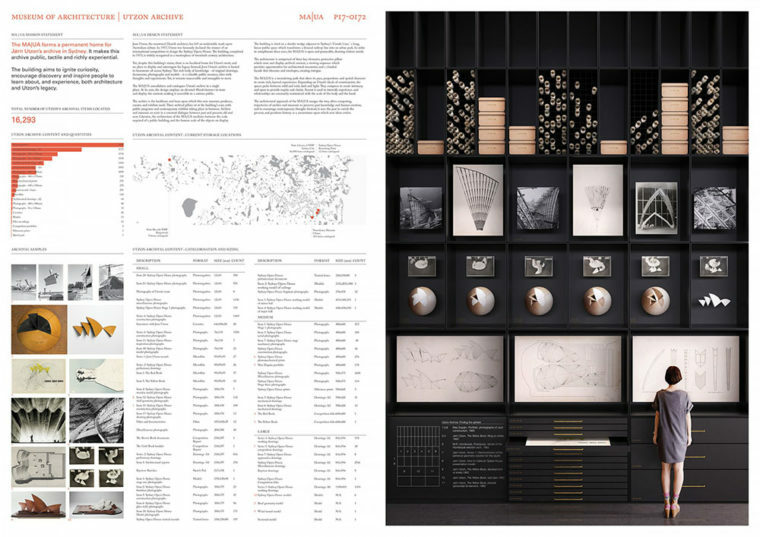 From the 385 graduation projects designed by 469 young architects, landscape architects and urban designers that were submitted for the Archiprix International Ahmedabad 2017, an international jury nominated selected 8 winners for the 2017 Archiprix International /Hunter Douglas Awards. The jury was delighted to see that students addressed pressing issues like food shortages and housing for the underprivileged through architecture. Good buildings can make the world a better place. But there were also concerns, since some projects were simply too ambitious. Nothing in architectural education can teach you how to solve institutional problems. The jury defined a good architecture project as one with a problem that can be solved. A project that shows balance and consistency between the set brief, the research and the design proposal. 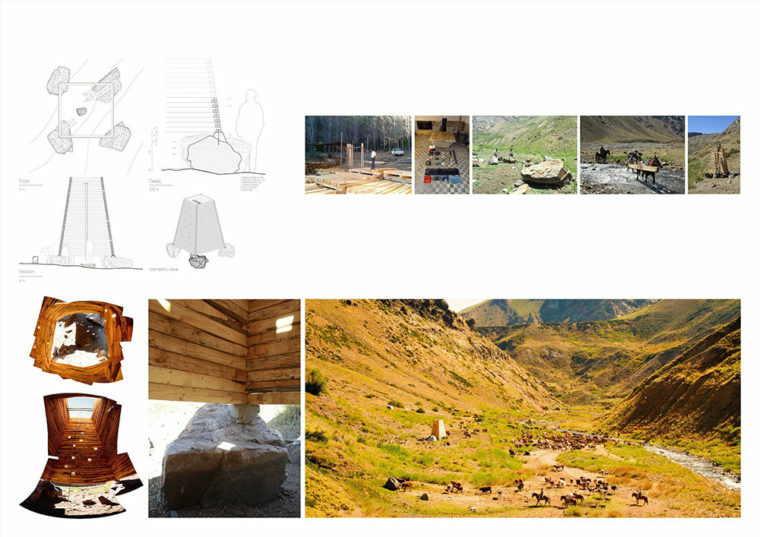 A project in which the graphics communicate the concept and proposal in a constructive way. A project that reflects the designer’s understanding of what architecture can achieve. A project that shows sophistication, that the designer knows when to stop. The museum exhibits the first ship constructed in Chile. 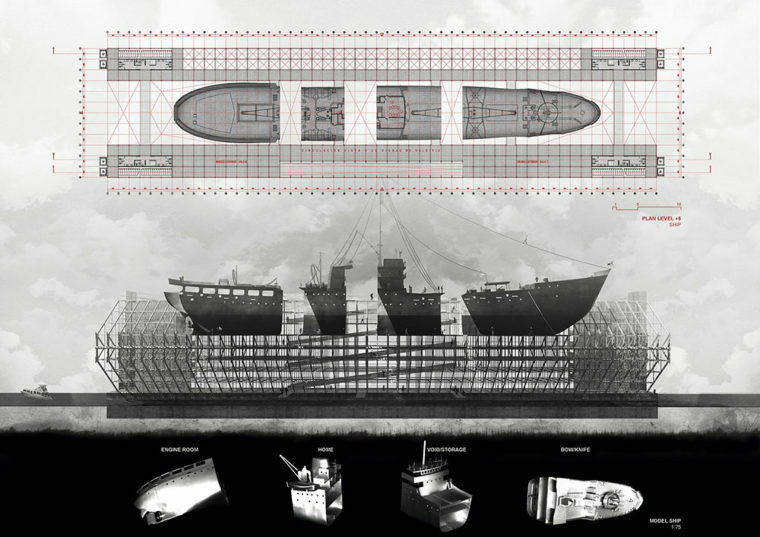 The strategy to exhibit the ship is achieved by disassembling it into its four most important parts, which are held in a fragile, transparent structure. In a city short of public space, the museum provides a solution by making the river the main public space. The jury: It is a simple idea, giving people a new identity by using something old, but the way this is done is far from simple. The project is not wilfully iconic but it turns into an icon. There are some suggestions about the programme, but it leaves room for the people of Valdivia to make it their own. The project improves onsite living conditions for workers. This is achieved not only by providing services like drainage and sanitation but also by designing very carefully an overall layout that offers safe areas for women and children. The structural grid allows for negotiation and flexibility. The jury: The project is an excellent example of the social relevance of architecture. It addresses an important issue that involves a most disadvantaged group of people: migrant workers. MA|UA stands for Museum of Architecture, Utzon Archive and forms a permanent home for Jørn Utzon’s archive in Sydney. The architectural approach to the museum uses the past to enrich the present, and positions history as a cornerstone upon which new ideas evolve. The jury: The way form, space and light are deployed celebrates Utzon’s heritage in an entirely different language. The wonderful panels show that the designers are destined to become architects. 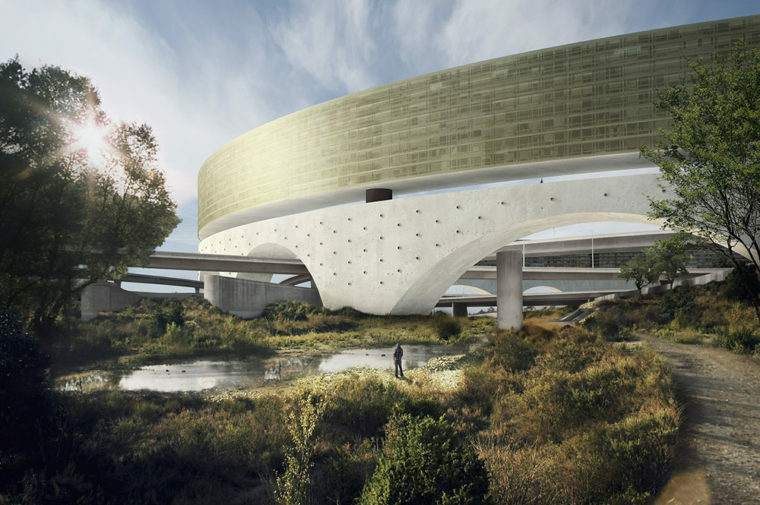 An enormous circular housing project is proposed at the junction of two freeways, the interchanges 710 and 105 in Los Angeles. While the junctions are icons of the 20th century, the project declares the motor age and its infrastructure to be history. Electrified, smart mobility enables us to make inhospitable places useful for other urban systems. The jury: One function of architecture to tell society how we might live in the future. 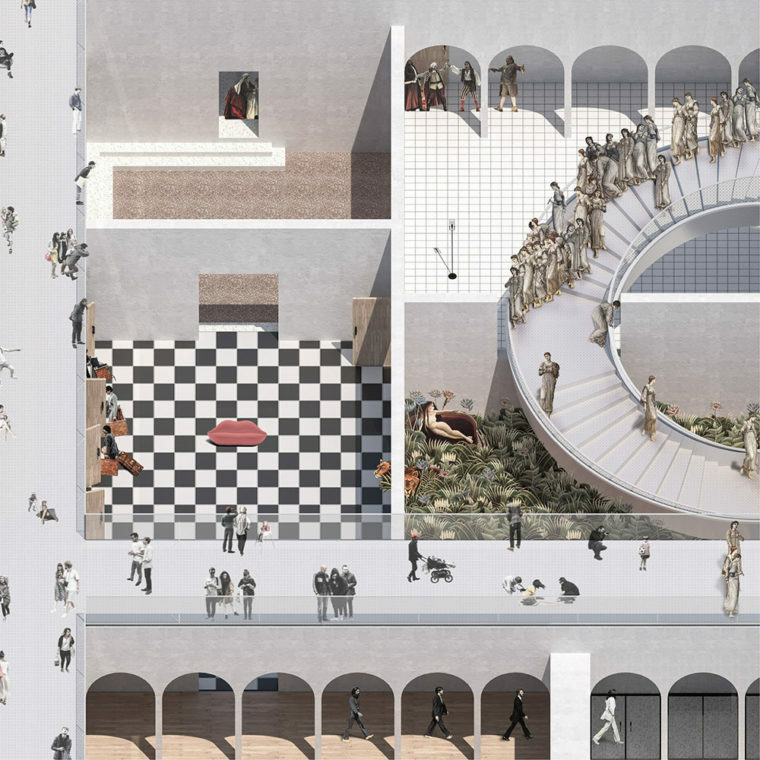 This project is a re-thinking of the city, showing the intrinsic beauty of infrastructure and celebrating the non-places between the junction by turning them into little parks. The project presents a building that houses a theatre and community centre. It consists of two contrasting spatial types: architecturally dense, small and discrete on the ground floor and open, large scale and indiscrete on the top floor. The project is a celebration of spatial experiences. The jury: The project is an exploration of the language of architecture. It challenges the whole idea of how we usually process our architectural spaces by programming and zoning and diagramming the programme. 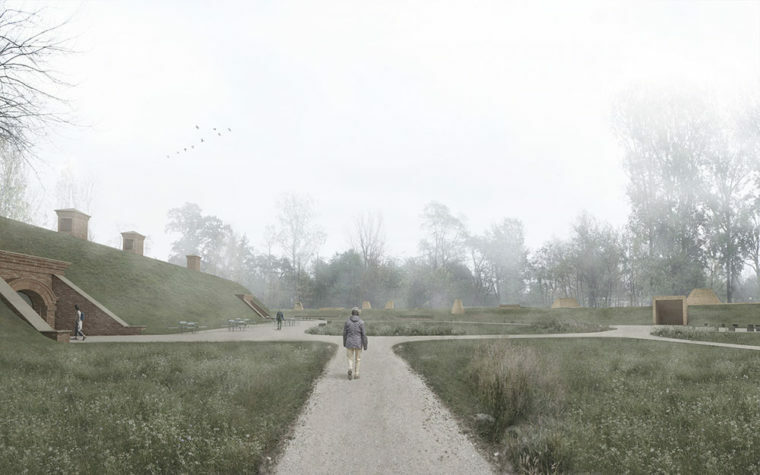 A fortification built in the nineteenth century near Warsaw is the location for a new thermal bath. In line with the characteristics of the location, the baths are realized underground. Only the skylights rise above the green hills. The jury: Among the many projects we saw that repurpose old structures by giving them new life and meaning, this is the project best explored. The scenography from the city to the pool is a nice sequence and beautifully designed. A building built by the Chinese in Ghana (Africa) officially functions as a Gold Exchange. 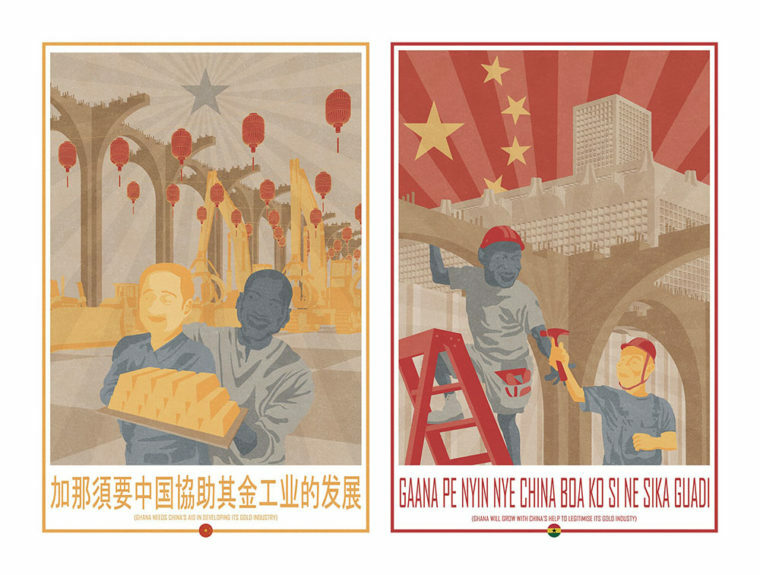 Invisable spaces serve the Chinese immigrant population. 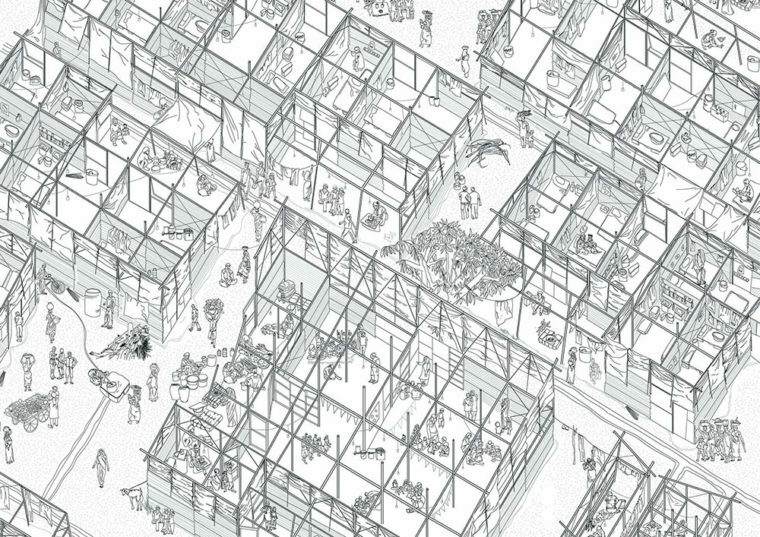 The conditioned air that cools these spaces leaks out into the informal market for the African villagers below and serves as a metaphor for China’s presence in Africa. The jury: The project is a polemic statement disguised as an architectural project. The project is valuable because it shows how people relate to one another in space. The main inhabitants of El Campanario high in the Andes are cattlemen, but tourists are discovering the beauty of this place. Three small interventions have been built here. The Shadow, the Line and the Trace cover a total length of 5 kilometres. The locations are aligned with the wind that blows up from the river basin. The jury: Less is More. The project is very powerful statement about research into and the craft of making architecture. Although simplicity comes to mind when looking at the structures, the making of them is complex. 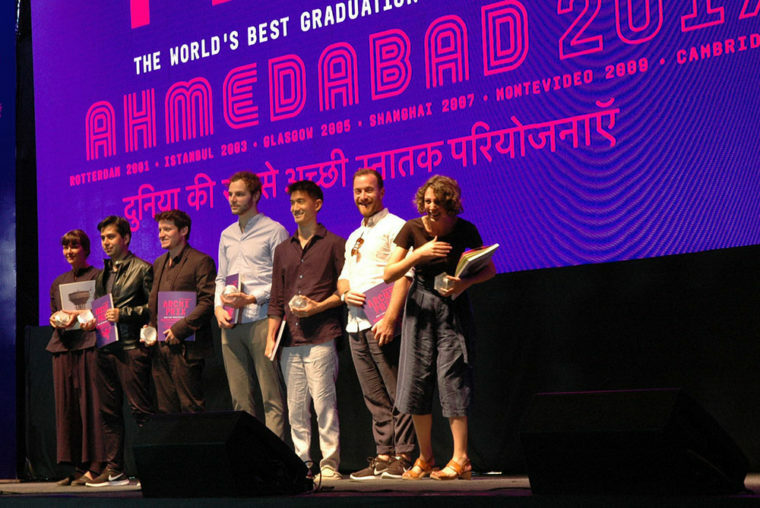 The jury members for Archiprix International 2017 were: Bimal Patel (India) – architect, HCP Design Planning and Management, president of CEPT University in Ahmedabad, and chairman of the Archiprix International jury; Frida Escobedo (Mexico) – architect, studio Frida Escobedo; Yttje Feddes (Netherlands) – landscape architect Feddes/Olthof, former government advisor on landscape; Marina Tabassum (Bangladesh) – architect, Marina Tabassum Architects; and Steven Smith (Great Britain) – architect/urbanist, Urban Narrative. The award ceremony was held on Friday 10 February at CEPT University, Ahmedabad, India.